Three teenagers battle their way through the world of competitive ping pong with their hearts set on the Olympics. *Q&A w/ filmmakers, players, and Will Shortz on Opening Night (10/23), followed by after party at SPiN New York. *Olympians Ariel Hsing and Erica Wu scheduled to be in attendance. Join us for the afterparty, featuring a live ping pong exhibition with the members of the U.S. Olympic Women's Table Tennis Team! Join us for a ping pong demo with the stars of Top Spin! Join us after the screening on March 14 for the afterparty (location TBA) featuring a live ping pong exhibition with the film's subjects! Join us for the afterparty, featuring a live ping pong exhibition with the film's subjects and members of the U.S. Olympic Women's Table Tennis Team! Enter your email address for upcoming screenings and updates! Thank you! Ping pong on! Ariel Hsing has aspirations to be the best table tennis player in the world and she is off to a great start. 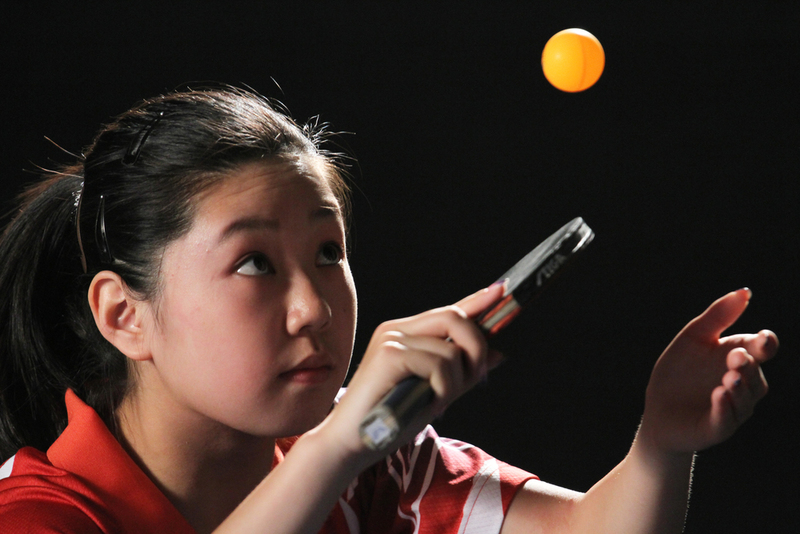 At 16, she is already a two-time U.S. Women's Table Tennis Champion. A San Jose native, Ariel wakes up every morning at 7am to practice serves before going to class. Training can last up to six hours a day at various clubs around the Bay Area. Along with her parents, Ariel has devoted her entire life to table tennis, with the hope of one day becoming an Olympian. In 2009, Michael Landers became the youngest U.S. Men's Table Tennis Champion at the ripe age of 15. Hailing from Long island, New York, Michael spends summers training in central China but most of the time you can find him playing at SPiN, a ping pong social club in Manhattan. At 17, Michael has learned the meaning of sacrifice, having given up his last year of high school for what may be his only chance at making it to the 2012 London Olympics. At one point, fifteen-year-old Lily Zhang was ranked second in the world in her age group, a first for any American-born table tennis player. Born and raised in Palo Alto, Lily got her start at the age of seven when she and her family played table tennis in the laundry room of the Stanford faculty apartments where her father taught math. Her evenings and weekends consist of training and she often misses school due to overseas tournaments. It is her love for the sport and the dream of playing in her first Olympics that keeps her motivated and committed to table tennis, the ultimate underdog sport. Franck is an actor, writer, producer, ping pong provocateur and co-founder of SPiN, a chain of ping pong social clubs. He lives in New York City. Jenine is a Chicago based motion graphics and 3D designer whose work can be found on screens both big and small. She launched herself into a successful freelancing career in 2004 where she's worked on documentaries, feature films and television series airing on networks such as History Channel, PBS and Fox. Jenine honed her skills as an artist at the School of the Art Institute of Chicago where she discovered how to combine her love for film, imagery and graphics into motion design. And, how to load and shoot a 16mm Bolex.